The Falcon Jolt features a lightweight alloy low step through aluminium frame, so it is perfect is you are less mobile or recovering from and injury or surgery. Comfort and ease of use are at the heart of this reliable high quality electric bike that comes with a powerful 250W motor and ample 36V 10AH lithium ion battery to give you all the range you need and adequately cope with any incline, The bike features a well padded comfortable saddle with suspension seat-post and has a front suspension fork to soak up the bumps on rough terrain, a rear rack is fitted as standard and the bike also comes complete with front and rear mudguards to protect you from the elements, it is also equipped with an angle and height adjustable handlebar stem for maximum adjustment and a handy propstand for easy parking. Max speed is 15.5 mph with 3 power assistance modes low/med/high (range is reduced depending upon the setting) Range average in normal conditions on low or medium power 30 miles uneven terrain, tyres at normal pressure, Range in worst conditions with a heavy rider ( So 90kg rider, 0 degrees Celsius temperature ? high power assist setting and uneven terrain) 20 miles Range in best conditions normal weight rider (so 60-70kg, 20 degrees Celsius temperature- mainly flat ground 35-40miles+) Please note the bicycle will require charging overnight before first use to avoid battery damage and ensure long life. The bicycle is supplied boxed so will require some minor assembly and ongoing adjustment of gears and brakes during its ownership. THE FLACON JOLT features a lightweight aluminium mountain bike frame with zoom front suspension forks. 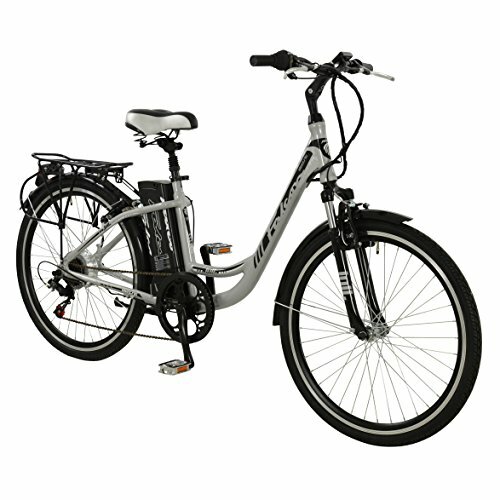 Comfort and ease of use are at the heart of this reliable high quality electric bike that comes with a powerful 250W motor and ample 36V 10AH lithium ion battery to give you all the range you need and adequately cope with any incline, The bike features a well padded comfortable saddle with suspension seat-post and is equipped with an angle adjustable handlebar stem for maximum adjustment. PLEASE NOTE the bicycle will require charging overnight before first use to avoid battery damage and ensure long life. The bike is supplied boxed so will require some minor assembly and ongoing adjustment of gears and brakes during its ownership. Braking is supplied via front and rear cable operated v-brakes for ultimate longevity and reliability. It has handy front and rear mudguards to help keep you clean and dry in all conditions. In addition all of our bikes comes with a 1-year warranty. DURABLE ALUMINIUM 18" FRAME, a size that is ideal for someone whose height is between 5'6"-5'11 and leg length of 29"-31" so it's a great size for adults and its also suitable for teenagers. With front suspension the Jolt is able to combat tough terrains and giving a comfortable ride even when going on or off road. Needing to stop is no problem for the Jolt, which consists of Dual Disk Brakes for powerful consistent braking, this system is very easy to use with the two finger braking levers. TYRES: The Jolt is equipped with high quality, tough and long lasting 26" ATB Tyres, for extra grip keeping you on the road. With the semi slick tread biting into the surface you'll always confident about controlling your bike. What keeps those tyres in shape are the Schrader Valve inner tubes, these are a very universal and popular tube type, easy to maintain and adjust the tyre pressure. The chain is a KMC Steel; 1/2 x 3/32" and is very tough and dependable. It also comes with a pannier rack!